I bought this for my mom for her birthday she’s in a nursing home and it is a great and fun Paulo and it always makes her feel like she’s not by her self and has a friend to put their arms around her and be comfy. Imagine coming home to a pillow that bears a striking similarity to a boyfriend; so much so, in fact, that it is even referred to as a boyfriend arm pillow. A pillow that actually holds and cuddles you back, like the ideal hug me pillow. A pillow that is always there to keep you company, there to help you pass your nights as a single person - or those evenings when your significant other happens to be away. And, as an added bonus, a boyfriend who really brings the muscle and the brawn to the party! So exactly how can a sleeping aid actually double as a boyfriend? Well like a surefire and ever dependable significant other, this plex cuddle pillow is more than a little dis'arm'ing. It is actually a boyfriend pillow with arm; a big soft arm that can wrap around you for endless comfort and nurturance. And like many modern, fashion conscious boyfriends, this arm body pillow actually wears a slick - not to mention whisper soft - T-shirt; the ideal boyfriend pillow cover. And unlike your boyfriend, these luxurious cuddle pillows never snore or talk back - major bonus! Also perhaps unlike many boyfriends, this model comes complete with a flawless muscular frame. As an even bigger bonus, the Boyfriend Body Pillow is an actual bed pillow arms; a functional and practical cotton fiber pillow that won't fall apart after a few uses or trigger your allergies. This ultra comfortable cuddler pillow is sure to comfort and support your upper body, the soothing contour of the arm supporting your neck for a painless and rejuvenating rest.Much like a good boyfriend, this pillow is reliable, dependable….and a whole lot of fun! THE ORIGINAL BOYFRIEND PILLOW - This is it; the original Boyfriend pillow, a renowned and much talked about human body pillow that has been featured on Amazon, YouTube video, Anderson Cooper, Web Soup, Ebay feature products, and Target, and has even 'co-starred' in the television series Glee. 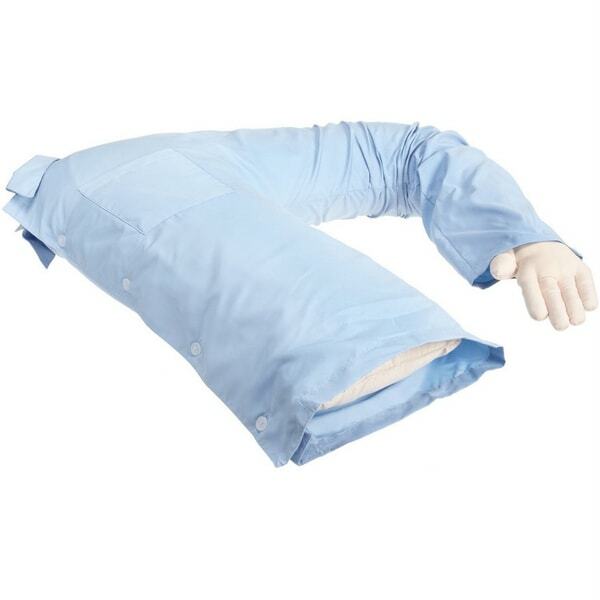 Ignore the imitators and lay your hands on the original and unbeatable boyfriend pillow with arm. AN INFINITE COMFORT - The ultimate cuddle pillow, the Boyfriend Body Pillow is akin to a virtual hug pillow; a thick, ultra soft fluffy friend culled from pure cotton, that even comes complete with an extended arm and a virtual real man. This is the perfect comfort pillow! Lose yourself in a warm, wonderful embrace of a pillow; one never too weary to cuddle and comfort you! HUGS ARE HEALTHY The ultimate arm pillow boyfriend is far more than just cute and comfy, but is healthful and beneficial as well. This cotton fiber feather-free pillow does not trigger or aggravate allergies. In addition, its ultra soft cover—which takes the form of a striking light azure T-shirt—won't itch or irritate your skin. GUARANTEED YOU WILL FALL IN LOVER - We guarantee the quality, craftsmanship and infinite comfort. THE PERFECT COMPANION - Don't you or someone you know want to feel loved. The Secret to Beating the loneliness - Spray a mist of your missing loved ones favorite cologne, lay back , Dream or let the memories flood in. Even though we are apart 3,000 miles, she says she smiles every time she thinks and/or lays on the pillow. She has even had better nights of sleep because the boyfriend pillow gives her the feeling of me being there. Definitely worth every penny. You cannot put a value or price on your lady's excitement and surprise when you get her one to fill the void when your apart. Hint to the manufacturer, offer men's cologne option. Love my new Boyfriend Pillow! This pillow is wonderful! It is the perfect size and "his" arm keeps my back warm. It is filled just perfectly! Just the right "fluff" and never any "guff" from this "guy". I bought this as a gift for my sister. She wasn't impressed. Her boyfriend thought it was great and kept it. This pillow is great for someone that doesn't care to sleep alone! I purchased more then one and gave it as a gift. You can get in there and have the arm around your neck and a couple sprays beforehand of your mates cologne and it's almost like they are there with you! Originally bought this pillow for my daughter for fun. Once we received it, everyone wanted one. Super cute and very comfortable! My daughter loves this pillow. It is very comfortable. The shipping of this gift was horrible! Overstock made a mistake and didnt have the color i ordered, which was fine but since they didnt realize their mistake till after the order they said they were sending it priority so it would get here by Valentines Day. It got here 5 days after Valentines day. And it was NOT sent out the way they told me. So my daighter did not have a gift on Valentines day. I will still order from Overstock but i will not trust them about the shipping. Slept like a baby ever since it arrived. Love it!!! My mother is in a nursing home across the country. She loves the first pillow so much, I ordered another so these could be rotated - one in the wash while one is being used. My step-daughter loves this so much. She curls up every night with it. One downfall is that her long hair can get tangled around the buttons on the shirt. Otherwise, it is a keeper. Surprisingly comforting. Helped me to relax and sleep. We bought this for a co-worked that just broke up with her b-friend. It was the perfect replacement! Gave this as a gift to my widow best friend. She loved it. "do you guys make one with the right arm? when me and my girlfriend sleep she sleeps in my right side. the pillow only shows a left arm"
You can flip the pillow over to have the arm on the opposite side. several years ago I was having back/shoulder pain from sleeping on my arm....This pillow Immediately cured my back/shoulder pain.....Its time for another pillow. "Can you remove the shirt off the pillow and change it?" Hello J0yful1, yes, this can be removed and changed. Thank you for shopping with us!